These seem to exist in almost every wood. Some are slightly sunken – something less than 0.2m and about a metre wide – while others are wide, two-lane highways with multiple sunken areas and banks on either side. Before the days when land was enclosed, people used to walk almost anywhere in country areas and this applied probably more to woodlands than to open fields. If there was a crop planted in a field you didn’t walk across the field and destroy the crop because it was someone’s livelihood to be harvested that year. 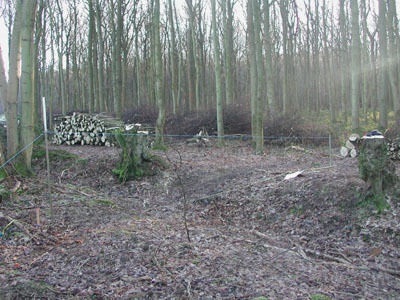 Trees in woods were not planted as densely as crops in fields so little damage was done by walking through the wood and in addition the woodland crop wasn’t going to be harvested for at least eight years, and with timber trees nearer 70 years. So people got used to walking through woodland to get from A to B, and, if they were going to a place of work, they used the same route frequently. You’ve only got to walk along the same route for a year and you will have made a slight depression where you’ve flattened the leaf litter – I’ve done it myself in my wood. Tracks like this can last for some time before they become filled in, due to natural processes and you may find some in your wood. What you’re looking for is a linear depression with no banks. The ground on each side of the depression should be the same height as the ground further away. If it is banked, you may not be looking at a track, but two banks running parallel. The best way to decide what it is, is to follow it. If it looks as though it might have been a short cut through the wood, then it has a high chance of being an old track used by people on foot. It may be that your linear depression is wider and deeper than this: more than half a metre deep and more than a metre wide. It could have water running in it; what you may have thought was a stream bed could well be a trackway. But is it straight or sinuous? – trackways are usually straighter than streams (but not always). It could be a drainage ditch: they run down the slope and tend to be straight as well, but are not very deep or wide. If by this point you are satisfied that you may have a fairly substantial trackway then, once again, follow it. Look at the sides and sometimes you will see trackways that join it. It may peter out at the top of a slope and then continue again further on. Or it may disappear altogether. Whatever happens to it, you can assume that if it is this wide and deep it was probably used to transport materials carried by pack animals or wheeled transport. The profile of the trackway should still be that of A in the diagram above – rounded, rather then V-shaped and with no banks at the top. Perhaps you have a trackway with a bank on both sides surmounted by a hedge and over 10m wide. The remains of the bank will still be visible and the trees growing on the bank may show evidence of having once been laid (assuming you’ve still got the trees). This form of trackway may have a bed lower than the surrounding land, or it may be at roughly the same level. This construction of trackway indicates that livestock may have been driven along this route, either to pasture or market. It is not unusual to find trackways such as this, but it is particularly important to record them as they were once part of the rural system of roads, and are not generally marked on modern OS maps. Farmers and landowners level them, the drivers of large forestry extraction machinery seem to look upon them as an assault course, and so we are losing them. The basic principles used for recording trackways is the same as that used for recording banks (look back at part 3). However, trackways do seem to vary more than banks in their profile (some peter out) so what I do is to measure the profile in one or two places which I consider to be typical of what’s there, and then add whatever variations there are. For example I might say, ‘…up to 3m deep…’ to show what it’s like at its most extreme. Perhaps I should add a word here about maps and different scales when you are plotting features. It’s important to realise that when you increase the size of a map (as I mentioned in the first part of this series) you are also increasing the inaccuracies of that map. It is better to use a map of the right scale without increasing its size if you can. 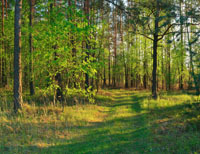 Woodland owners receive a large-scale map of their wood in their contract when they apply for a grant from the Forestry Commission under the EWGS. Large-scale maps can be bought at various scales from local agents of the Ordnance Survey with your wood in the middle. Details are on the OS website.